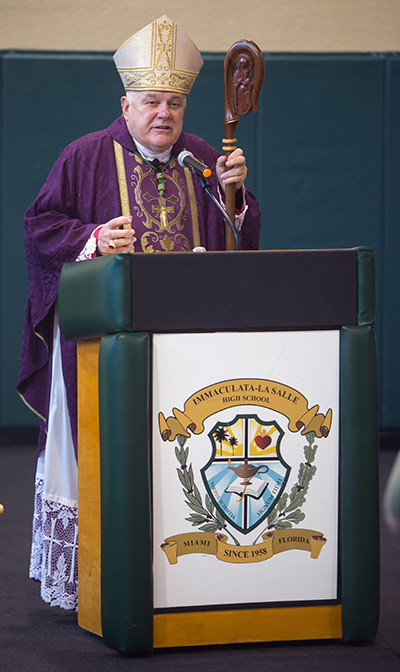 Archbishop Thomas Wenski preached this homily Dec. 1, 2018, at a Mass at Immaculata-La Salle High School in Miami, marking the school's 60th anniversary. Today the Church initiates the season of Advent, reminding us that Jesus is coming. For this reason, the Advent Season is a season charged with expectations, it is a season filled with hope. This message of hope is certainly sorely needed today. We live in a world of fragile peace and of broken promises. Advent reminds us of this fact as well. The world is broken – and it needs fixing. And if the world is broken it is because we have forgotten about God. To live without God, to live without reference to his truth, to pretend that we can organize our world, that we can live our lives without God, without acknowledging that he has made us more than just to die one day leaves us pretty hopeless. A world without God is simply a world without hope – a world without a future. The world needs Christ and his good news of peace, joy and reconciliation. He is our hope – a hope that will not disappoint us. Archbishop Thomas Wenski delivers the homily during the Mass for Immaculata-La Salle High School's 60th anniversary. In today’s first reading, from the Old Testament, we see Jeremiah. The world in which he lived was certainly broken: the people of Israel would soon be sent into exile, their king deposed, the temple destroyed. But, in the midst of all that was going wrong, he had hope. He trusted that God will fulfill his promise: a branch from what seemed to be a dead vine would sprout – and a new King and a new Jerusalem would emerge. He looked to the future – and in that future God’s promises would be realized. A young maiden named Mary would say “yes” to God – and in that “yes” she opened the doors of the world to a new hope. Jeremiah’s hope would be realized in Jesus who would come as the Messiah, the Christ, and Christ would establish a new Jerusalem, a new temple in the Church that he would found. Advent encourages us to stay awake, to keep vigil so that we might recognize Christ when he comes. The first week of Advent focuses on the Second Coming of Christ. In the Gospel today, Jesus speaks of that Second Coming. So, these weeks of Advent are not about “Santa Clause coming to town,” they are about Jesus coming to town. And so, during these weeks, we look forward to his Second Coming in glory; but at the same time, we remember his first coming in our flesh when the Word of God entered into our world becoming a man like us in everything but sin. At the same time, we also remind ourselves that Jesus comes to us even today in Word and Sacrament. Some people think of Jesus’ Second Coming as something terrible and terrifying. I once saw a sign in front of a storefront Church that announced: Jesus is coming back and he is mad as hell. That doesn’t sound like “good news.” But Jesus’ return in glory is good news – and it is good news because it is hopeful. This broken world will be fixed: as a Christmas carol says: “God and sinner reconciled.” And that is also what Advent is about. We have nothing to fear about Jesus’ Second Coming as long as we don’t deny his First Coming, as long as we do not resist the ways he comes to us today – in word and in sacrament, and also in our brothers and sisters, especially in those who are the “least among our brethren” – the poor, the abandoned, the marginalized. Remember, he tells us at the Last Judgment he will say: come and inherit the Kingdom, for I was naked and you clothed me, I was in prison and you visited me, I was sick and you comforted me, I was a stranger, a migrant and you welcomed me. So Advent also challenges us to get ready for the Lord by getting our own lives in order – by living in the world but as citizens of the world to come, by seeking to repair the brokenness of our world through our efforts to reconcile with those we have offended, or ignored, or marginalized. We prepare to welcome Jesus who is coming to town by living our lives not just for the present moment, not just for ourselves but in view of eternity. God made us to know him, to love him and serve in this world, so as to be happy with him for all eternity in the world to come. Of course, today this school community, Immaculata-La Salle, celebrates 60 years. And the reason this school exists and why it has existed these past 60 years is so that those who pass through its halls will learn not only how to do well in this life. Thanks to the excellent education received here, graduates of Immaculata-La Salle have certainly done well in life. Many of the leaders of this community are graduates of Immaculata-LaSalle; and I dare say that most of the alumni are grateful for the education they got here. But, a Catholic education – and an education in the spirit of the Salesians and their founder St. John Bosco – is more than learning how to do well; it’s also about learning how to do “good” and in doing “good” to learn to know God, to love God and to serve God in this life so as to be happy in the life to come. If the Advent Season is about hope; so is this school. This school is about offering a future of hope to its students because it offers them God. And I would remind the faculty – and the parents of the students – that sacrifice so much so that these young people can have a Catholic education that teaches them about God, that teaches them that God matters and thus that they should live lives that show that God matters, that if we give these students the best in technology, if we give these students the best in academics and in sports programs but we don’t give them God we will end up giving them too little. Advent invites us to prepare for the last coming of Christ in glory even as we remember his first coming as a baby in Bethlehem and daily coming among us – if we are alert enough to notice and to care. And our anniversary celebration also invites us, in the Advent spirit, to look to the past with gratitude (60 years of excellence in Catholic education), to embrace with enthusiasm the present and all the good that is being done here today, and to look forward to the future with confidence and great hope. In too many schools – where education is stunted because teachers and students cannot even avert to God on campus or recognize that he matters in their curricula – the teachers are reduced to merely teaching the “test” as it were. But here, for the past 60 years, and today and for as long as there is an Immaculata-La Salle that is faithful to its Catholic mission, the teachers can teach the “yes” – a “yes” like that of Mary’s “yes” at the Annunciation, that can open the doors of our world to hope, to Jesus Christ, the hope that will never disappoint.